You can even create an old-school floating Inspector pallet by navigating to View menu → Inspectors → New Inspector. Keep in mind that FileMaker Pro Advanced remembers your last Fields vs Objects tab settings across sessions. So if you prefer to see the Objects tab every time you enter Layout Mode, FileMaker 17, the consolidated version of FileMaker Pro and FileMaker Pro Advanced, will show it by default even after closing and reopening the app. Another helpful change that I'm sure will be greeted with a round of applause is the ability to modify a grouped object's size or location without having to ungroup it first. You no longer have to dread the loss of that hard-won Hide Condition, Button Action/Script Parameter, just because you want to nudge something over a bit or lengthen a line. Thank you, FileMaker, Inc.! 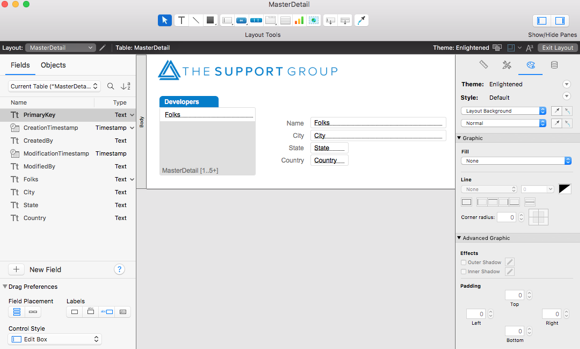 Learn more about the new features in the FileMaker 17 Platform.